Speedrunning a game like the new Thief sometimes means knowing when to slow down. Youtuber prenatual has set a pretty high standard with the complete playthrough documented above, a two-hour, 1300-point custom speedrun with no kills, alerts, or knockouts. 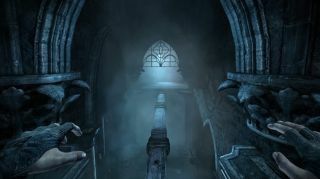 As we heard in advance of its release, Thief lets players craft some fiendishly difficult and complex custom requirements for different playthroughs. Each of the difficulty settings is assigned a point value which adds up to a final score once the game is completed. Thief's in-game leaderboards then rank these custom game finishes based on this final score as well as how quickly the score was achieved after the game's release at the end of last month. Prenatual's speedrun includes the Iron Man setting, where any death or failed mission causes the entire game to restart and also doesn't see Garrett make use of extra tools such as the wrench or wire cutters to open up new paths. It's a unique achievement, but also one that could grind on a person a bit, as prenatual mentions in the video's comment section. "It took me much longer than I expected while being not particularly hard and, frankly, wasn't a very enjoyable experience," prenatual writes. "The ghost playstyle requires that you don't interact with the environment or enemies in any way whatsoever, so most of the time the sneaking boiled down to finding holes in enemies' patrols and swooping past everyone. No distractions or anything fancy." Still, as an artifact of the way players create game experiences that sit decidedly outside the norm, it's fantastic. The video description includes more commentary from prenatual on some of the issues that come up when speedrunning the new Thief, as well as links to highlights throughout the video and a look at the the stats page at the end. Since the video does show the complete story, the usual spoiler warnings apply.